This square fire pit will add style, functionality and warmth to any patio, backyard or other outdoor space. It comes with everything needed for the best fires including a spark screen for keeping embers and sparks in the fire pit, a wood grate for optimal air circulation and a poker to safely maneuver firewood while inside the fire pit. Handles on the two sides of the fire pit are perfect for lifting, cleaning and dumping out ashes. Plus, the star and moon cutouts on the side create extra interest as the flames light up the shapes in the dark. Overall dimensions: 24 inches wide x 22 inches long x 17 inches tall without screen (24 inches tall with screen); weighs approximately 20 pounds; bottom of the bowl is 15 inches long x 15 inches wide. Bowl is 9 inches deep. With the 4-leg stand, the fire pit bowl sits 8.75 inches above the ground, so it is the perfect size for a small fire with family and friends. 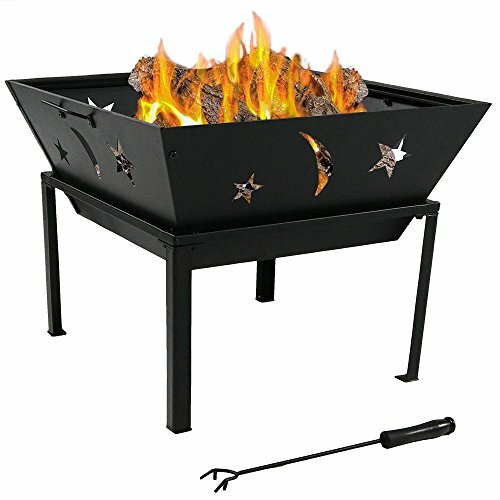 Fire pit is made from durable 1.5 millimeter steel with a black high-temperature paint finish for long-lasting strength. Each order includes a square wood burning firepit with 4-leg stand, a 16-inch log poker, a 20.5-inch square spark screen for extra safety, and a 16-inch wood grate for better air circulation. The star and moon cutouts on the side of the firepit help your fire breathe as it creates beautiful shapes and shadows in the dark. Handles on two sides of the bowl make it easy to lift the whole bowl off the stand for quick and easy cleaning. The bottom also lifts out so you can easily reach all corners.